I love the new baby stamp set, Sweetest Gift. After I went through the entire new annual catalog, this was the set that I had to have right away. And then I got it, and I’ve had such a hard time using it. I know it will make some awesome baby book pages, but for cards, I was having a hard time. A couple weeks ago, I finally made a really simple thank you card with it, but I still hadn’t been able to make the “Adorable BABY” stamp work for me, and I love that stamp too much to never use it. Sometimes all you need is a good color combo and a challenge to use it. 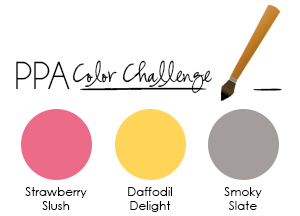 What a fun color challenge they have over at Pals Paper Arts this week! These colors, it turns out, work great for a baby card. And this card is so simple to make but has a lot of wow. The Vintage Faceted Designer buttons add dimension, light, and a little sparkle and transform plain into wonderful. I hope they never retire these buttons! While this card took me forever to design, it took no time to actually make. I think I’ll make several and leave off the sentiments until I know what they’ll be used for. This simple design would work with many color combinations and any sentiment, so I think it’s a good one to keep in my arsenal. I hope you love it as much as I do. Don’t forget, Monday, August 5, is the deadline to subscribe for my August Stamp-of-the-Month Club. The stamp set this month is Mosaic Madness, a wonderfully versatile set. Comment here or at the original post, or email me, to subscribe, and I will get back to you with details. Or you can RSVP here. Have you tried out Paper Pumpkin yet? If you subscribe by August 31st, your first two months are $10 each! The first month, you receive Clear Block D (an $8.50 value) along with your project. You may cancel or skip a month at any time. Check it out! Very sweet card! Any new parent would love to get this beautiful card! Thanks for playing! You did a fantastic job with the stamp AND the colors. Thanks for playing with the Pals! Very pretty! 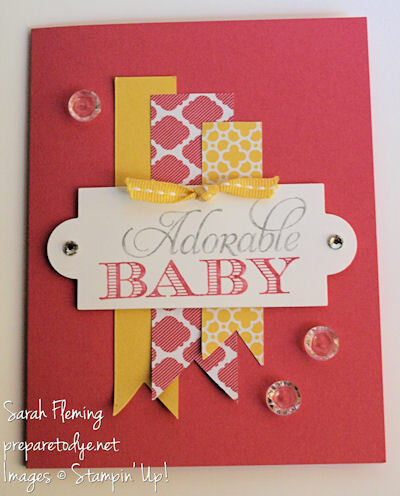 I love how you used the stamp, just perfect for a baby card. The random buttons are sweet! Thanks for having fun with the PALS this week! Lovely! Clean and Simple! Thank you for joining the PPA team this week! Hope to see you again. Thanks, ladies! And thanks for letting me play along!